"What In Fashion" Means Today in Manipur? Insert few segments of the symphonic musical notes of our sacred and symbolically significant "Pena" in between a hip-hop based electronically manipulated voice based song and then that becomes uniquely happening song of the day in fashion. Or we could see, some folk lines juxtaposed as a background score and that is the home spawn instance of the present entertainment milieu that defines being in fashion by diluting the original values of things extraordinary. Many may of course object to this point of view by proposing that mixing and matching the old and the new enhances both the trends in innovative ways. But the problem lies in the fact that most of the people who are related to the industry of hybrid synthesis of trends or genres are neglecting the fact that traditionally bound cultural forms of art and music were composed long back with great care and attention by our creative ancestors. Our ancestors have not composed some forms of song or dance or any other art forms to sooth our eyes or ears but more carefully considering the fact that each art form should bear with it some message or trends that should identify, define and represent our culture. Apart from some selected persons, many people have aborted logics and instead have devoted themselves in their extravagant efforts to create new and different with a profit oriented mindset behind their actions. Acknowledgement of the meanings inherent in old trends of thought being reflected hugely in our traditional ways of representing oneself is a far off call to adopt by many nowadays. 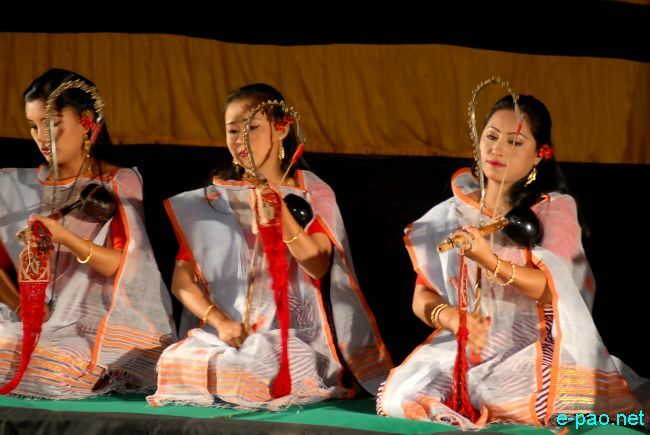 The soul that makes every art and musical forms of Manipur one of the greatest celebrated ones in the entire world is the way each element of it is composed with stories of our cultural evolution imprinted on its structure. Today in the name of revolutionizing fashion industry in our small state, not just in the department of arts or music but even in other aspects of our social life are bombarded with imported cults. Superimposition is what in the making and what resultant effects we could bear witness to, are the ways in which we even get to see our Manipuri brides dressing up in algae green potloi and blurring all our eyes with this trend breaking fashion statement. It is true that avant-gard(ist) statements are needed too even in the field of style business for newer orders to flourish but even then is it worth it for us to give away the pure or the original completely that has been our invaluable possessions so far... indeed every Manipuri could not deny the fact that 'how' we are known today in a grandest of ways throughout the world has to do with our cultural inheritance that has defined us in the most blessed of ways. Whether it is in terms of our glorious traditional attires or the folk art and musical forms, we are a celebrated whole with our original art and cultural forms thriving vibrantly in full life with us along the passage of time with its unique style statement. Self investigation is a must step to undergo if one is determined to play with the complicated structures of traditional bound elements or else it will end up in the multiplication of confused cultural definers in our society. The ordinary fusing and juxtaposing of arts/musical/cultural forms need to be done carefully or even attempted with a great study as a back-up factor or else in our blind effort to set up newer trend setters, we may end up altering our sense of identity beyond repair. Without realizing the life altering impacts of misguided actions, one must try to avoid playing with the fire like dynamism of cultural entities in his/her hollow attempt of being fashionable mimic men.